Torus Power has a large network of dealers available for sales and installation support. Locate your nearest Torus Power Dealer. All 120V Torus Power isolation transformers are available for direct purchase on this page. If you are looking for our specialized 240V products then please contact us directly here sales@toruspower.com for more information. Torus Power accepts Visa, Master Card, and Discover cards for online purchases. Please call 877-337-9480 to process payment using American Express. Submit this form if you live outside continental Canada or USA. View AVR2 Series Specs The AVR2 series includes the most feature-rich models in the Torus Power line-up, with enhanced Ethernet control and monitoring features. Performance and protection remains consistent with other models in the Torus line. The AVR2 Series contains all of the features of the AVR, with the addition of Individually addressable outlet zones, power-up sequencing with selectable delay time between zones, scheduling features with options, automatic reboot, and more. Optional Pre Quoted Shipping – Shipping is $50.00 via UPS ground to continental North America. If you requested a quote for alternate shipping, pls enter the quoted amount. View AVR Series Specs Torus Power AVR models add Automatic Voltage Regulation to the standard Torus Power features, thereby enhancing protection against voltage sags, brownouts and surges. Ethernet connectivity and RS232 interface makes AVR models ideal for basic home monitoring applications. Torus AVR will keep the output constant within the range of 115 Volts to 125 Volts, with an input voltage of 90V to 130V. Pre Quoted Shipping – Shipping is $50.00 via UPS ground to continental North America. If you requested a quote for alternate shipping, pls enter the quoted amount. View RM Series Specs The original Torus Power models in the RM series remain unparalleled for performance, protection, and value. A popular model in the RM series is the RM 15, which has been consistently top-rated by leading audiophile magazines. The RM 15 Plus has more outlets, and Increased current headroom and reduced audible noise relative to the RM 15. View TOT Series Specs The TOT Mini, rated at 7 Amps, is ideal to provide clean power to Audio/Video systems, projectors, flat panels, powered speakers, media/ source players, processors, or network devices. The TOT Max, rated at 15 Amps, can provide current to demanding power hungry systems including substantial power amplifiers. Optional Pre Quoted Shipping Pre Quoted Shipping – Shipping is $50.00 via UPS ground to continental North America. If you requested a quote for alternate shipping, pls enter the quoted amount. 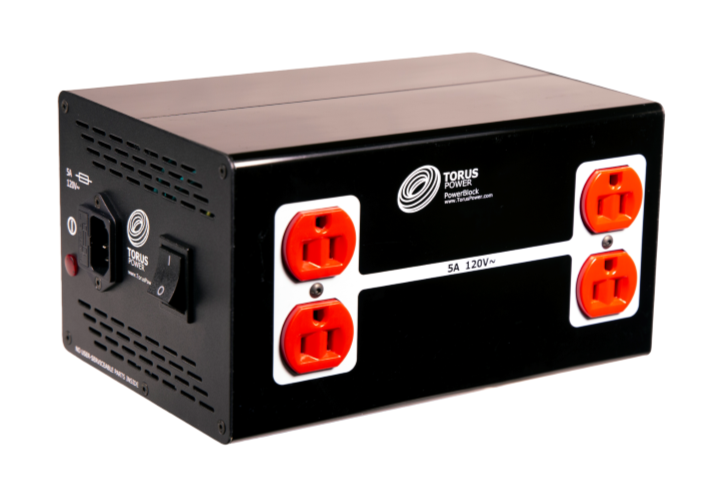 View PB Series Specs – Torus Power Block PB 5 and PB 10 are ultra compact and portable Toroidal Isolation Power Transformers, and the most affordable products in the Torus line-up. The compact footprint and rugged construction of Power Block models make them convenient for use in almost any situation. They look sharp on or near a component shelf, on any floor surface or can be located elsewhere when space is at a premium.